Some years ago, before marriage and children, a girl’s nights in seemed to be a fairly frequent occurrence and enormous fun. 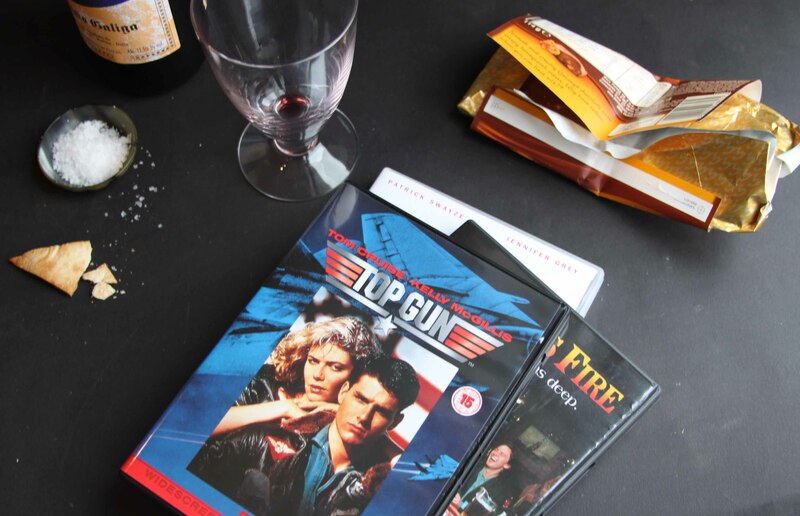 Different in those days though when, to be frank, a couple of bottles of wine, a packet of cigarettes and a video (remember those) of Take That Live made for a belting evening with the girls. You know who you are! These days however, finding a free evening is a different ball game. Children need ferrying from one after school activity to another and there is a husband to be fed. The girlfriends from those heady, single gal days are now dotted around the World rather than living just down the road and the Take That video looks like a sad relic next to all the dvds. So I was particularly pleased when a couple of Dorset friends suggested coming over for wine, movies, popcorn and ice cream. We are going to kick off with frozen raspberry daiquiris, a grown up slush puppy. I persuade myself that the lime juice and berries go some way towards off setting the rum and the fabulous bright zingy pink seems a suitably girly start. 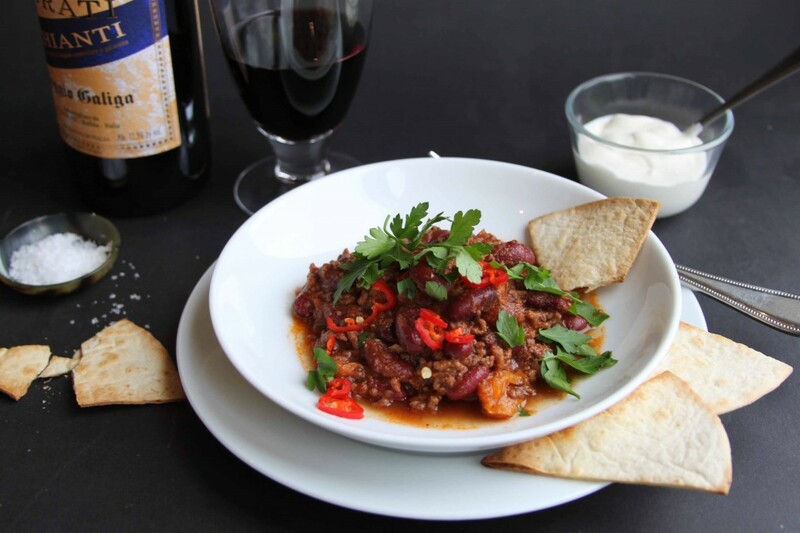 Then chilli – perfect fork food to eat in front of a film, spicy and warming. Rich with tomatoes, earthy cumin and a good blast of heat from the chilli and cayenne. Alongside I will offer the essential sour cream, grated cheddar, extra chillies and home made tortilla chips. For pudding I have good vanilla ice cream in the freezer and the wherewithal for either hot chocolate sauce or salted caramel sauce depending on our mood. All that remains is to decide whether it will be a “no one puts Baby in the corner”, “Goose, you big stud” or “Kevin, I think I broke your shower” evening….. There are probably hundred of recipes for Chilli but this is how I make it. You can go the cubed beef or mince route – I use mince just because that is what I have always done and a little nostalgia is not a bad thing on a Girls’ night. For the tortilla chips, I buy regular tortillas and cut them into 6 or 8, brush lightly with oil, sprinkle with a little salt and bake at 200 for about 5 minutes or until crisp. They are just right with the chilli but you could serve rice too. You can cook this ahead of time or the day before. Preheat the oven to 150. Heat the oil in a large pan and soften the onions and pepper for about 10 minutes until soft. Add the garlic followed by the mince and cook, stirring, until brown. Add the cumin, salt, cayenne and a generous amount of black pepper, then the tomatoes, puree, ketchup and wine. Give it a good stir, bring to a simmer, put on the lid and cook in the oven for an hour, add the kidney beans and cook for a further hour. Check for seasoning, sprinkle over the parsley or coriander and serve with whichever accompaniments you choose. Enough for 4 with rice. I was going to give you a fabulous pudding this week, Chocolate Fondant with Salted Caramel anyone? However, this being Valentine’s week I thought everyone would be awash with chocolate puddings so I’ve decided to go savoury. 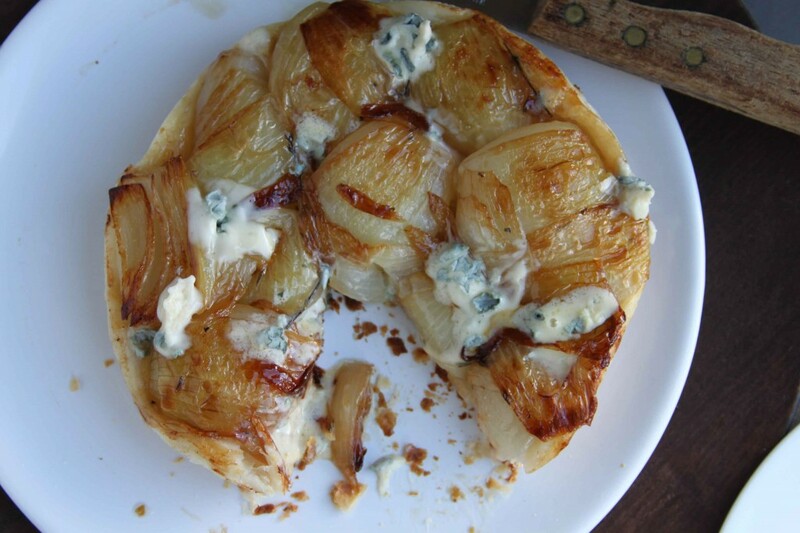 Melty caramelised onions, both sweet and salty with a hint of cider vinegar and thyme topped (or bottomed) with crispy flaky puff pastry, followed by tangy blue cheese, what is not to like. I’d be delighted to eat this a deux but you could also cut it into four and along with a little dressed rocket or watercress it would be a stella starter. Preheat the oven to 200. You will need a frying pan that can go on the hob and in the oven, I used a 20cm le Creuset (www.lecreuset.co.uk). Cut out your circle of pastry just smaller that the circumference of the pan. Melt the oil and butter in the pan and add the onions. Cook for 15-20 minutes until the onions are softening and getting a little bronzed. Add the sugar, thyme and vinegar along with some salt and pepper and turn the onions carefully. Ideally you want them to remain in their quarters but some will fall apart, it doesn’t matter. 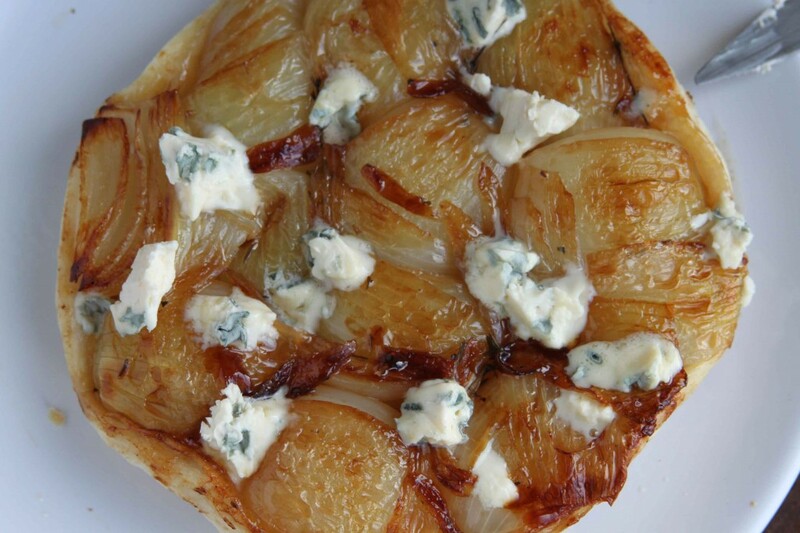 Take off the heat and lay the pastry circle over the top of the onions, tucking the edges in. Put in the oven for 30 minutes but check after about 20 and if the pastry is getting too dark cover with foil. When the time is up, very carefully put a plate over the tart (still in its pan) and then invert the whole thing. 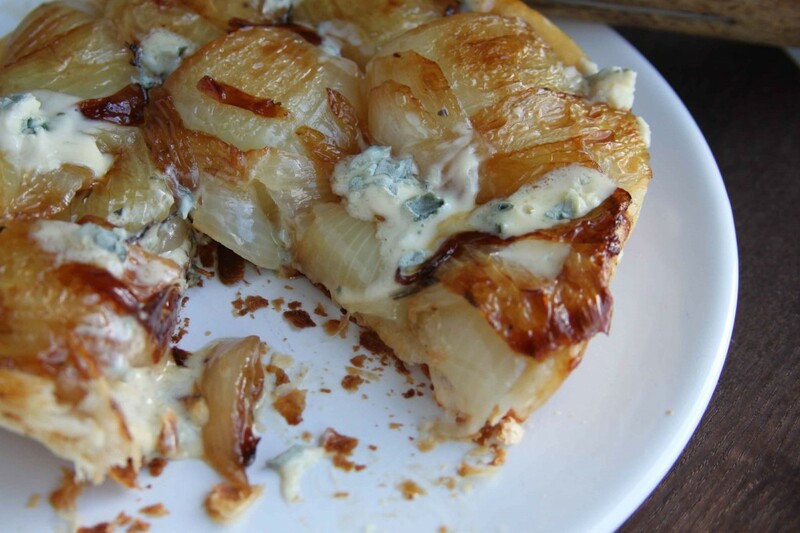 As soon as it is out of the oven crumble the blue cheese over it so that it starts to melt. Serves 2 or 4 and is perfect with a dressed green salad.